Come work with us – if you enjoy being outdoors, have a knack for customer service, and have a bit of green thumb apply today! 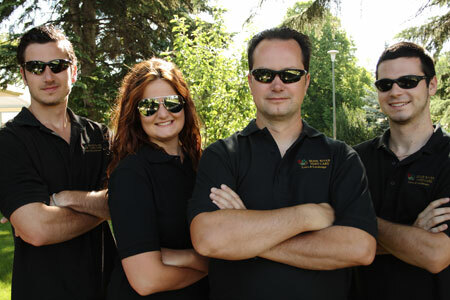 Seine River Yard Care is always looking for seasonal employees, with April to October being the busiest time of year. If you are interested in applying, please e-mail your resume to us at info@sryc.ca. We start crew members as labourers, with motivated crew working their way to be crew foremen & landscape techs. Crews work outdoors all day in nice weather, and also work in many extreme conditions of heat & cold. The summers bring hot weather and hard work, cool and damp conditions in the fall, very cold winters, and generally spring is nice but sometimes cool and damp. Crew members are expected to be in decent physical shape, with the ability to learn and retain what you’ve been taught. As SRYC is a multi-faceted company, you will need to push wheelbarrows one day & weed a garden or mow a lawn the next day. If you want part-time casual work in the winter, you will be operating snowblowers and shoveling snow as needed. Currently, SRYC supplies a uniform. SRYC stresses workplace safety, and concentrates on quality work with a safety first attitude. We work with machinery large & small, every one requires training & experience to use safely & with best results. You will be able to take pride in your work, and know that what you build and install will remain for years to come for our clients to enjoy. You will learn skills and abilities that will benefit you later in life, and work with a team that is confident and dedicated. Teamwork is one of SRYC’s main crew qualities, as we are only as strong as our weakest link. If you’d like to be a part of the SRYC team, please apply! Please specify the times of year you are available, and days available to work.